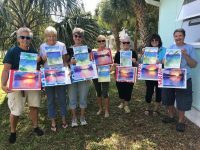 Many thanks to Cedar for hosting a watercolor workshop in Gulfport and for donating a portion of the proceeds to SPHF! Check out her website for a schedule of her workshops and more at Cedarkindy.com. Lady in Red Ball a Huge Success! Thank you to everyone who came to our 23rd Dance for Women and supported the Fund by purchasing Silent Auction Items, 50/50 Raffle Tickets, and Hearts for the Love Tree. We hope you enjoyed the Dance as much as we enjoyed planning it! The Lady in Red Ball is Sold out. If you are looking for tickets, or want to sell your ticket, please post details on the Lady in Red Event on the SPHF Facebook page. Check back regularly to see if anyone has responded to your request. SPHF is unable to coordinate buying or selling already purchased tickets. 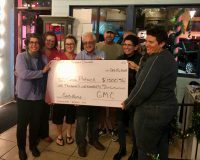 Some of the Board (Lisa, Mandy & Carol), accepting the $1,500 grant from the Gulfport Merchants Chamber, so SPHF can continue to assist women in the community with their healthcare needs. 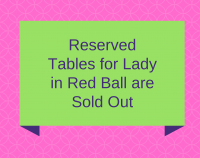 Reserved tables for the Lady in Red Ball are Sold Out. Individual tickets are selling fast, so purchase yours soon to be part of the 23rd annual dance for women! Tickets can be purchased online here, or at Domain Home Accessories in Gulfport for cash or check only. Visit us at St. Pete Pride! 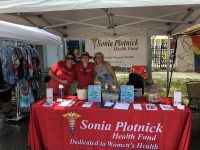 Look for the Sonia Plotnick Health Fund booth at this year's St. Pete Pride Festival on Sunday, June 24th! Come learn more about the Fund, meet our Board members, and learn how to be involved in improving the health of women in the Tampa Bay area. We'll also have games to enter for fabulous prizes. © Copyright The Sonia Plotnick Health Fund is a 501(c)3 charity.